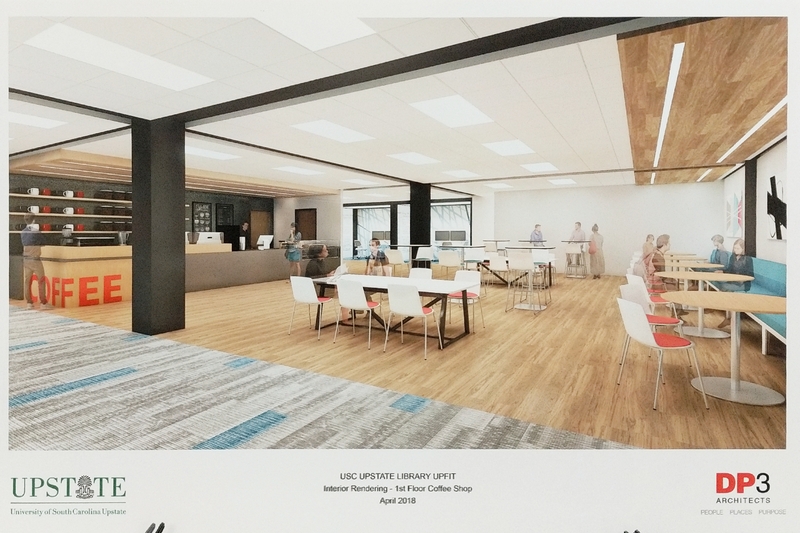 Keep up with Library Renovations from this Guide! Renovations in the Library are ever changing and rather fluid. We will attempt to keep you updated on the upcoming changes as we learn about them. 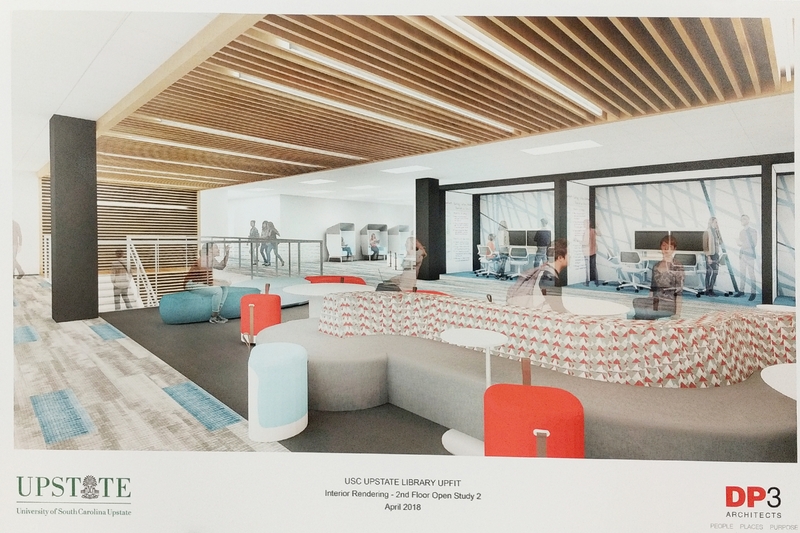 Please follow us on the Library Renovations LibGuide and Social Media to learn more about the changes. More compact shelving will be installed in the area that once was Lab 115. We are still waiting for the sprinklers to be installed. 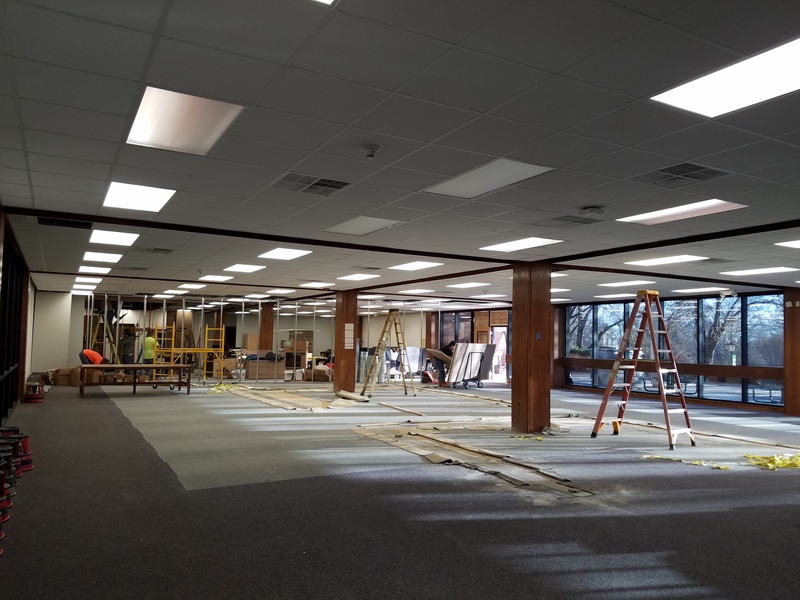 Shifting of the books from the second floor to the new shelving will begin sometime mid may. 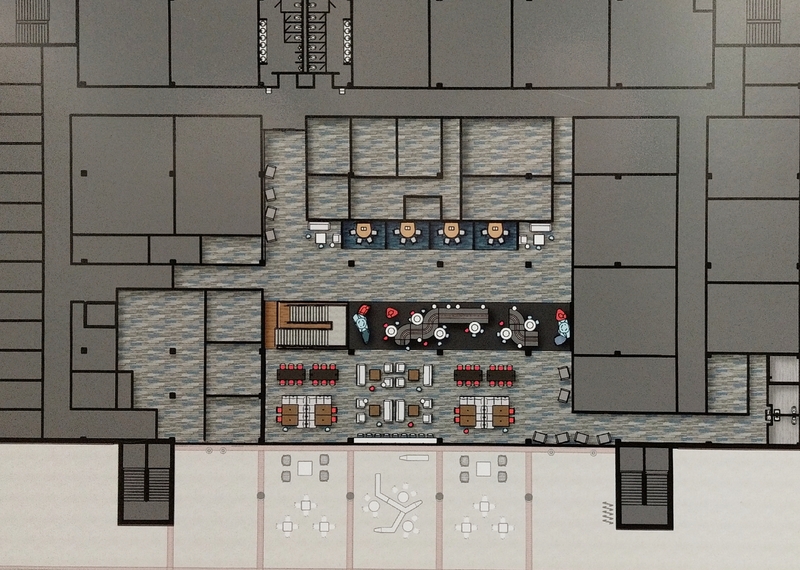 New furniture will arrive sometime in the summer. New seating around the Cafe is in and getting used. You can now enjoy seating near the windows for a sunny spot to study. There are still a few study rooms (check out the keys at circulation) but 3 study rooms were turned into new restrooms near the cafe. 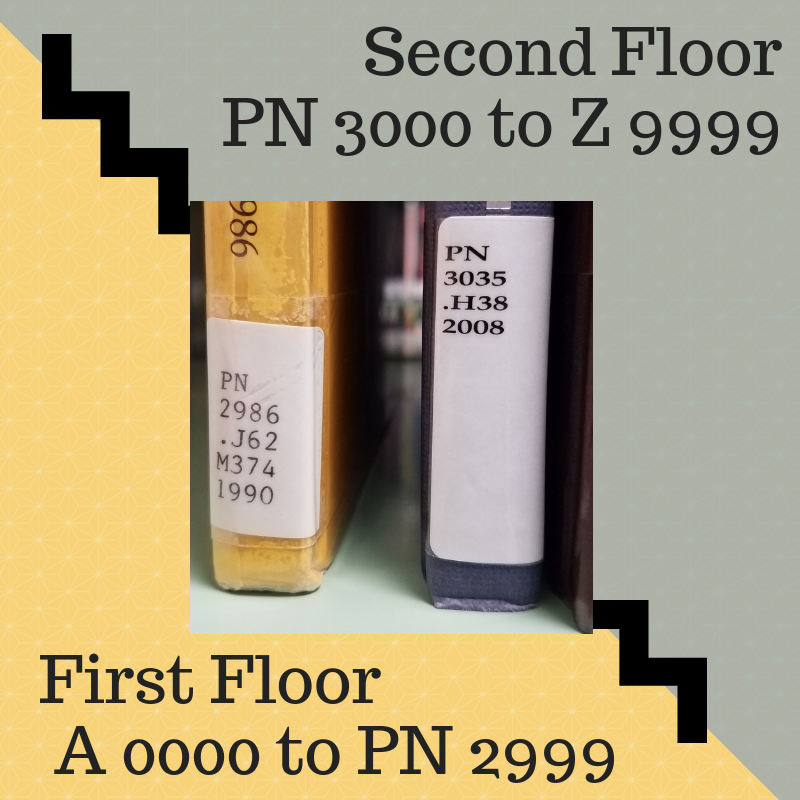 Shifting continues and if you need help to find a book remember to Ask a Librarian. Both computer labs are upstairs now call 247 & 249 remember that the sign on the door tells you if it is open lab or closed for a class. 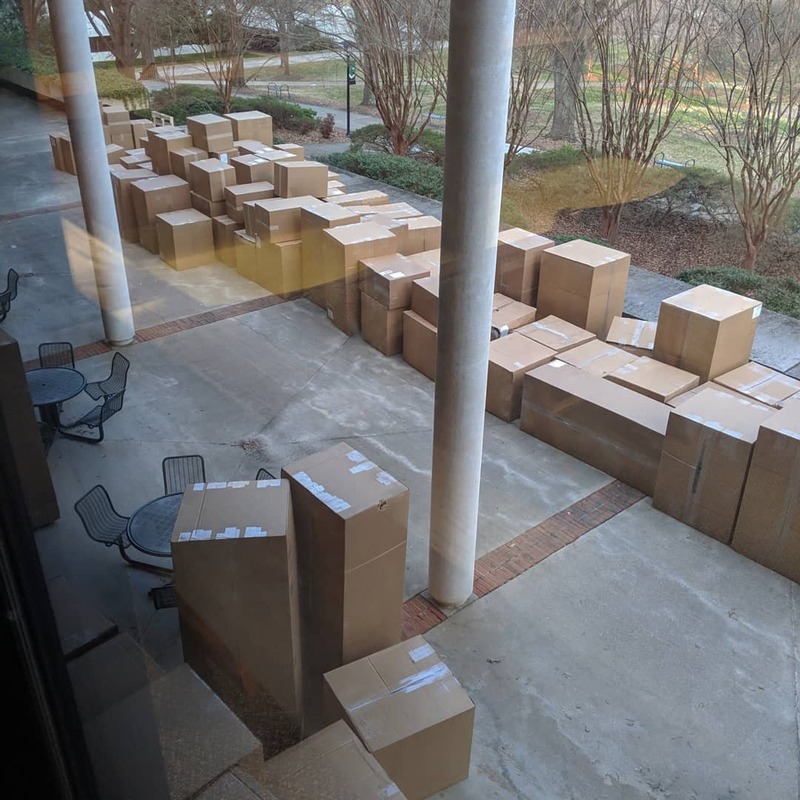 Also moved is the Library Lab Help it is now behind the Circulation Desk, ask there for help. 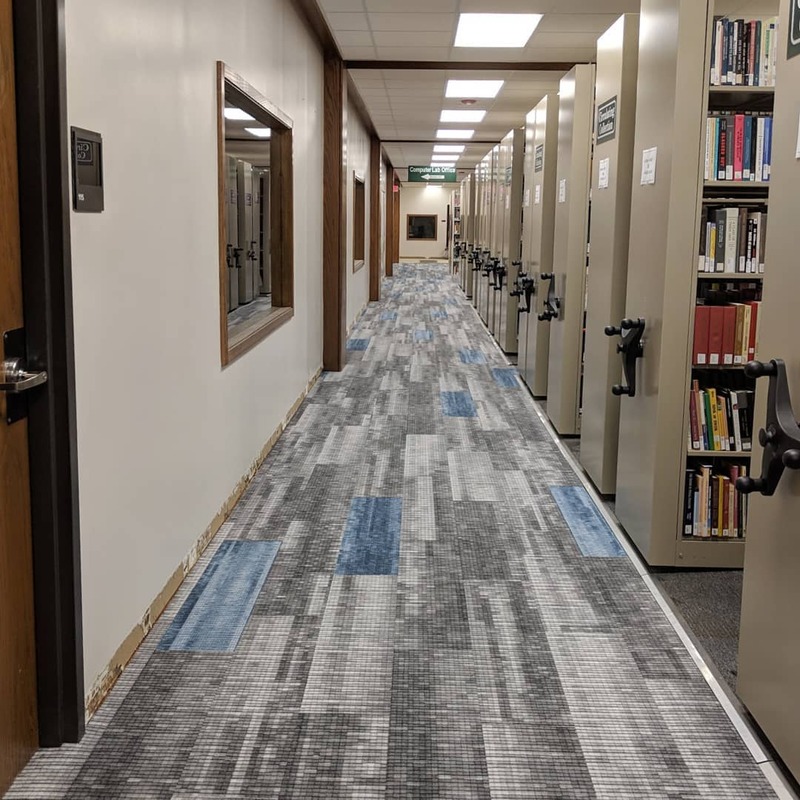 The Library has changed tremendously over the last 2 months, it was hard to keep up with all of the activity, walls went up and walls came down carpet came up and carpet will go back down.... Seems like every day something new is happening. Construction on the new cafe was done behind a temporary wall that came down after classes ended. 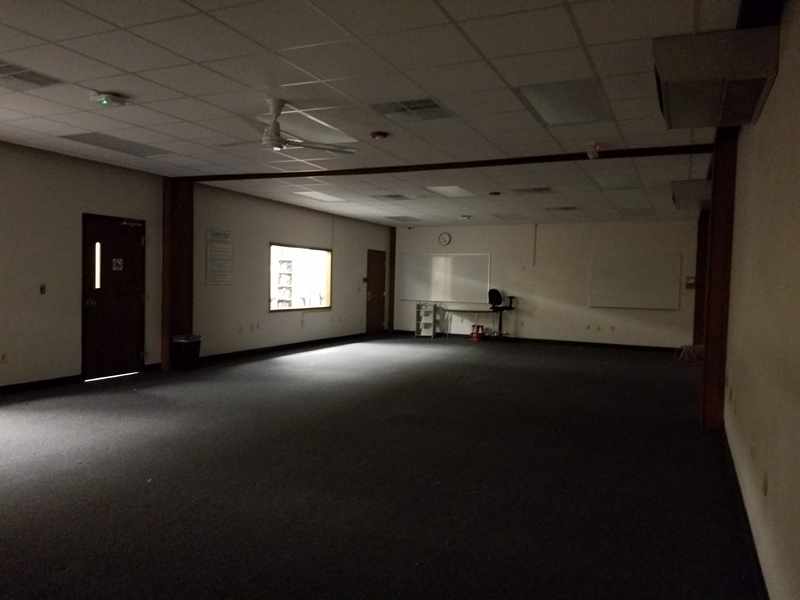 Tables were removed and we await new furniture that should be arriving the first part of the new year. Electrical outlets were installed in the floor so more charging and plugging can take place. Computer Lab 115 downstairs was dismantled as the new Computer Lab 249 upstairs was being finished (to be opened for the new year), look for new moveable shelving to be installed in what was 115 some time this spring. 10/17/2018 - Shifting should be completed today!!! We have moved all the books from the shelves by the window and a few of the P's from upstairs into the new compact shelving, in the next few days the empty shelving should disappear and then new carpet will be installed. Then the tables and study space should be in place for finals time (We Hope!!). Check back to see what call number is the last to move downstairs now some Ps will be downstairs the rest upstairs. 10/9/2018 - The glass walls or "store fronts" were installed and even though we are waiting on a few last pieces of backordered trim they look shiny and new!!! now you can see the books in the new compact shelving. 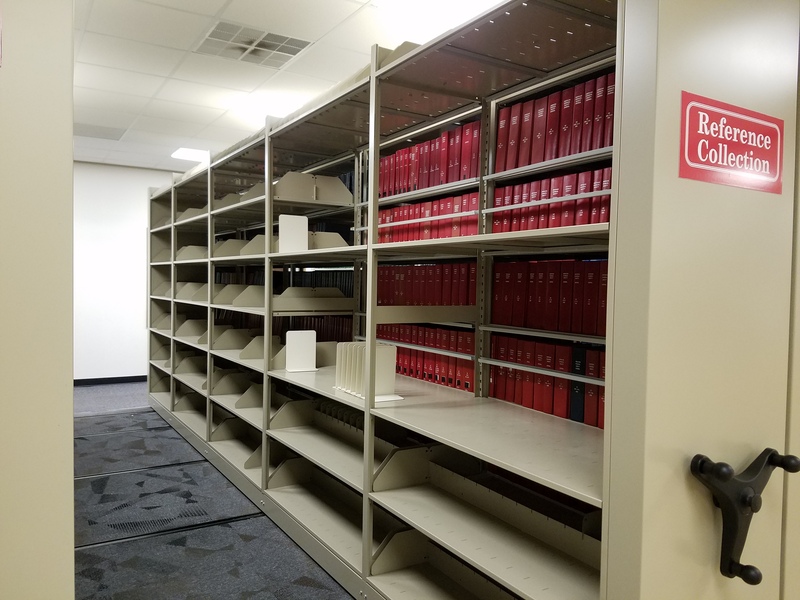 9/25/18 - With the completion of the Compact shelving shifting has begun!! In just two days most of the Reference Collection has jumped the aisle to the new shelves. Once the old shelves are empty and cleaned then the Circulating collection will begin the journey across the carpet to the compact shelving. 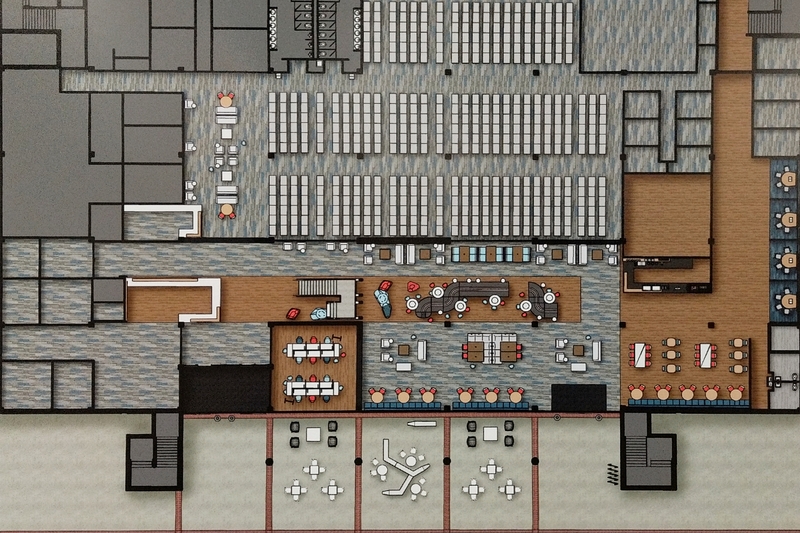 Thank you for your patience while we make some noise and new space. 9/20/18 - The compact shelving instillation is COMPLETE!! We will work at shifting books onto the new shelves starting MONDAY September 24th! This Friday, Saturday and Sunday in preparation for the shifting some work will be started, it may be a bit noisy as the book ends are added to each of the 1800 shelves. 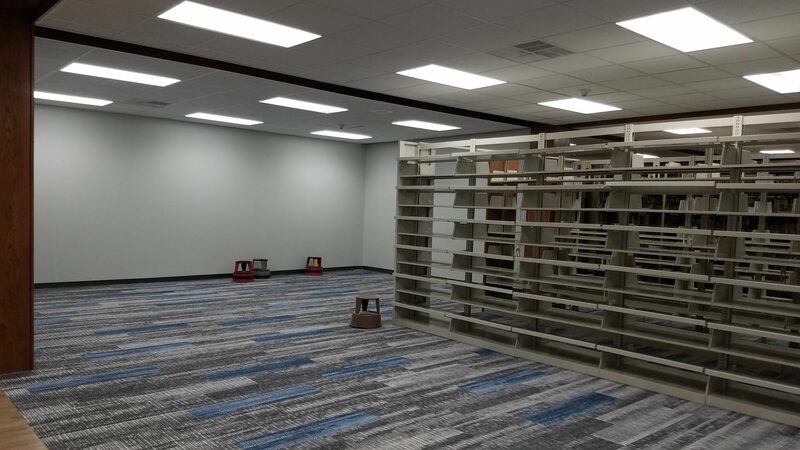 9/17/18 - The shelves continue to be installed and will soon have books moved onto them. 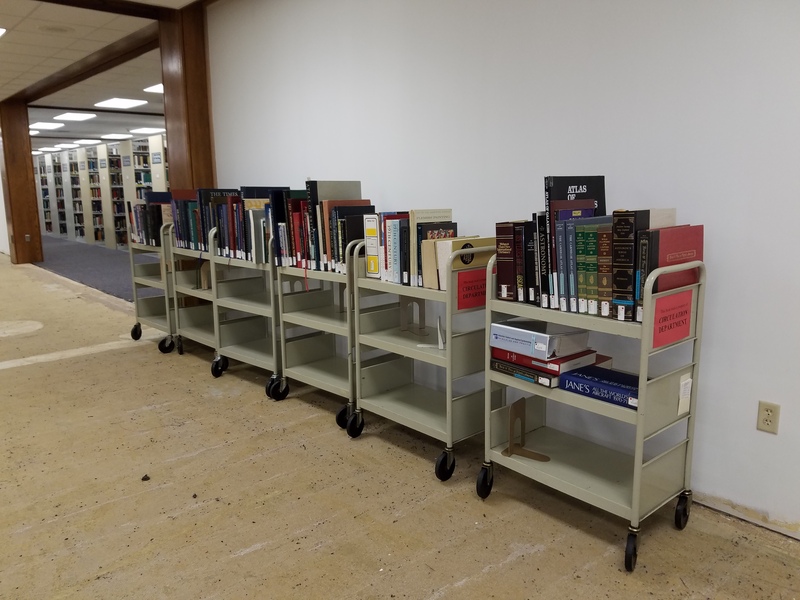 As the Circulating Collection is moved onto the new shelving the old shelving will be dismantled and moved out making room for more study space. 9/10/18 - Things are getting started now!!! 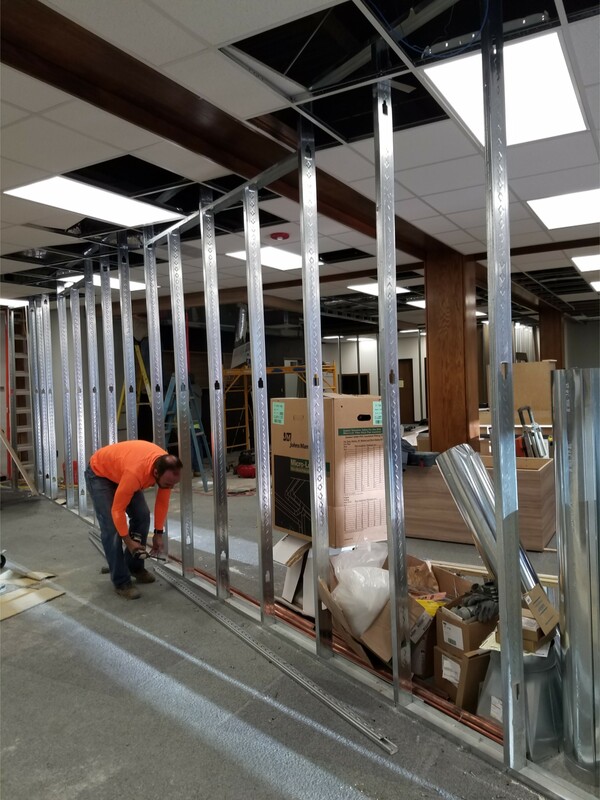 Construction has begun on the compact shelving and for the next approximately 14 days there will be workmen and noise in the main part of the Library. Please excuse the mess and noise as we grow! 8/22/18 - Back shifting is in progress to prepare for the new moveable shelving to be installed later next month. 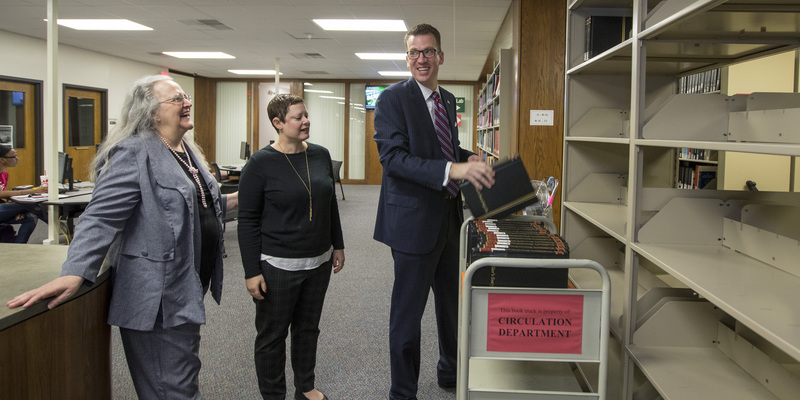 You will see library staff and faculty busily moving carts full of books. 8/7/18 - We are getting measured for new floor tiles, Can't wait to see what the new floor will look like! 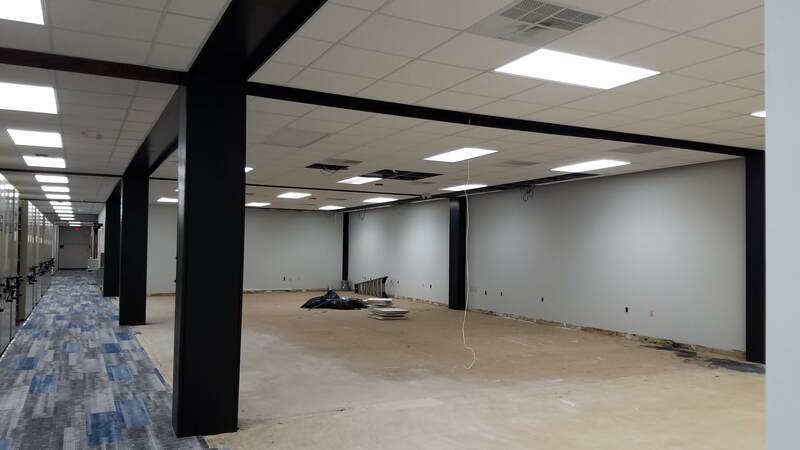 8/2/18 - The new computer lab 247 upstairs is finished and will be open for use soon. 7/27/18 - Measurements for the new Glass Walls were taken. Look for them to be installed soon. 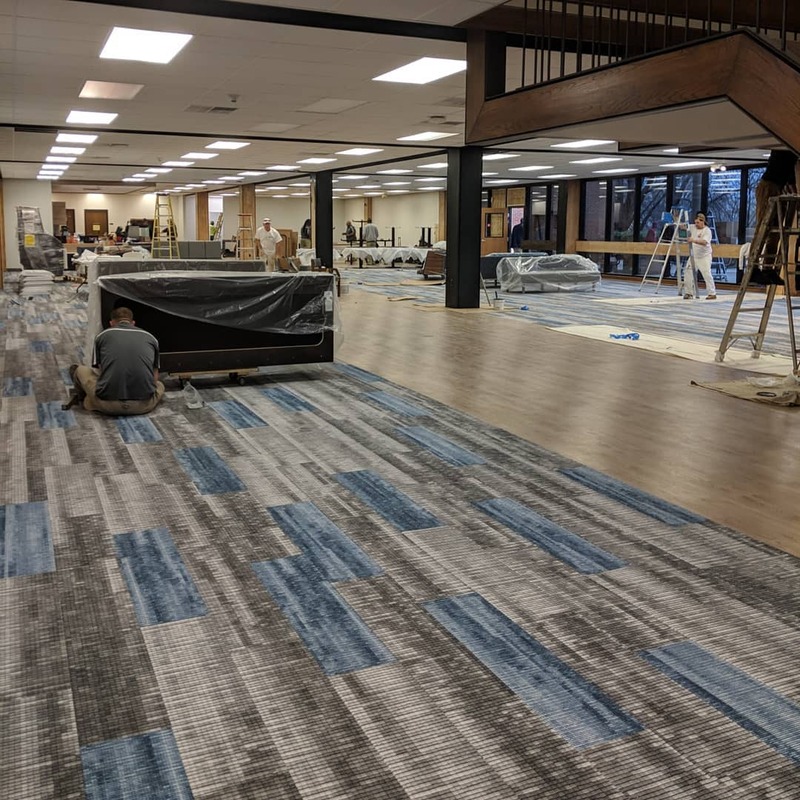 7/5/18 - The carpet in the middle of the Library has been pulled up making way for the new shelving to come in mid August. March is blowing in changes in the library, most can't be seen from the front door. Take a walk around the stacks to see that the computer lab 115 is now an open area waiting for more compact shelving to be installed. The Library Computer Lab Office (old 117) has also been moved and you can now get computer help at the circulation desk. Shifting continues and now the current periodicals and the juvenile books are within the compact shelving. The empty shelving at the back of the library will be coming down making room for offices to be built behind the coffee shop. Old Computer Lab 115 Opened up. Shelving Ready to be taken down to make way for Office Space. Computer Lab Office is now behind the Circulation desk. It's the first of February and changes continue. 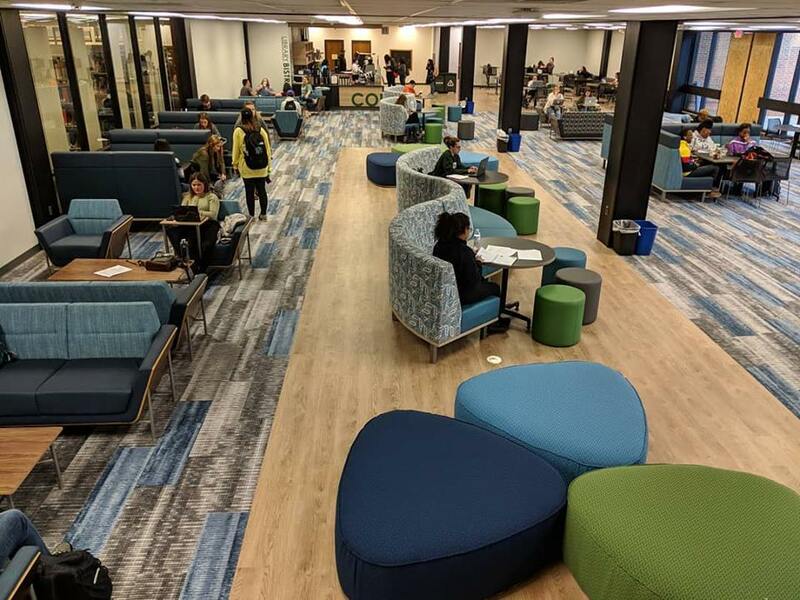 You can smell the coffee from Perk Up cafe when you walk in the library and the new seating is filled with students studying and socializing. 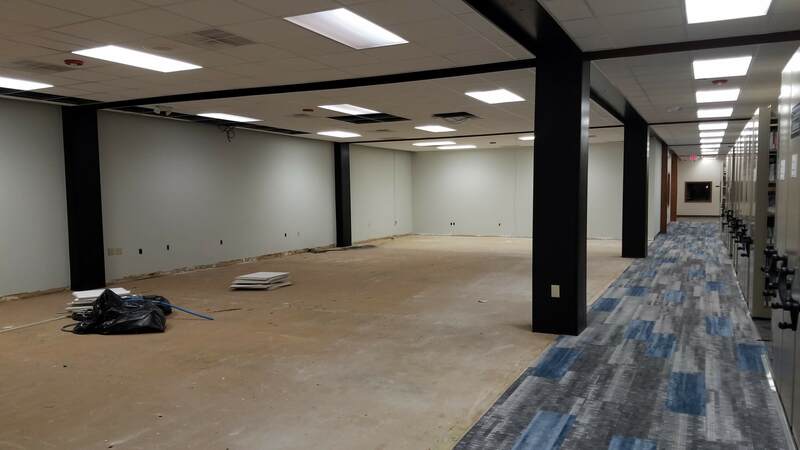 Offices are being moved and created up in the Circulation area of the library and the Lab Help will no longer be in office 117 but rather behind the circulation desk. The collection continues to be shifted to make space for more of the collection to move downstairs, and soon the demolition will take the walls out from the old computer lab 115 to make room for more compact shelving. 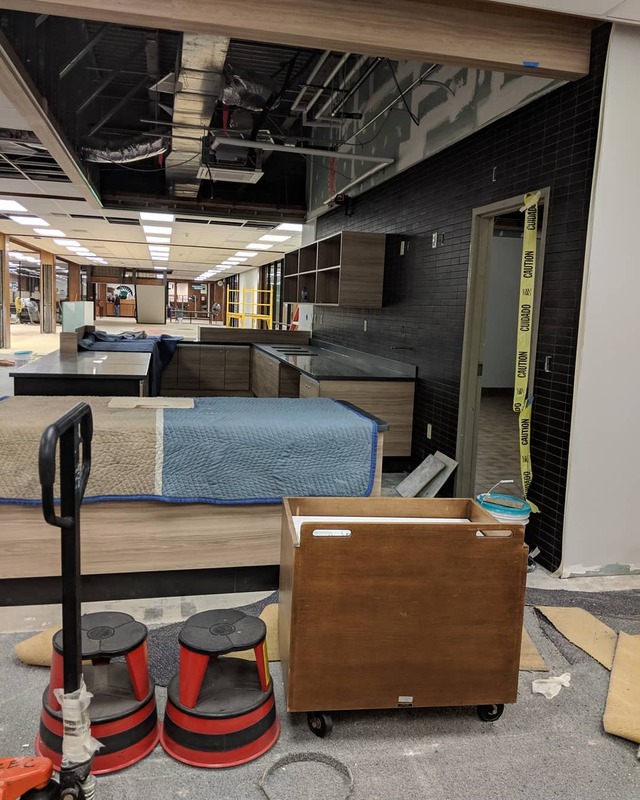 As classes are getting ready to begin construction is still going strong, when you visit the Library you will see new flooring and furniture and the Cafe is set to open any day now. Change is happening on a daily basis. There are no longer computer labs on the main floor they are both upstairs INSIDE the library, Lab 249 is currently being fitted with computers and teaching equipment right next to Lab 247 that opened last semester. There still is no access to the classrooms from inside the Library you will need to use the stairs outside or the elevator. Coming soon will be the demolition of the wall that made up Lab 115 to make room for more compact shelving. Keep track of all of the changes on our social media platforms.